TORONTO — The 2010 Canadian Football League schedule kicks off with a Grey Cup rematch, features classic Labour Day match-ups, and promises to go down to the wire. “All of the elements are in place for a tremendous 2010 season: competitive teams, great players and, of course, tremendous fans,” said CFL Commissioner Mark Cohon. “In fact, we start 2010 with significant momentum because of our fans. 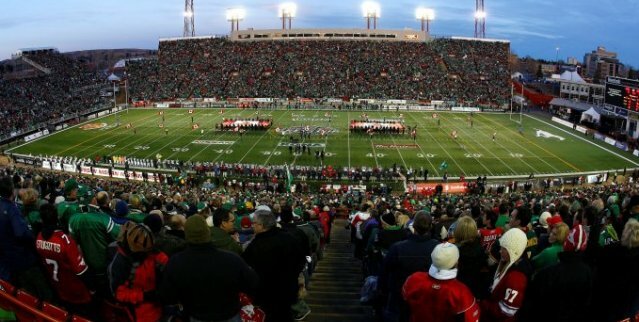 We’re coming off a 2009 season that featured a record television audience for one of the most remarkable Grey Cups in history, dramatically higher ratings for the CFL on TSN throughout 2009, and the eighth straight season we reached a total attendance mark of more than two million fans,” he said. Officially released today, the 2010 schedule is capped by the 98th Grey Cup Game in Edmonton on Sunday, November 28th. It also features the first regular season CFL game ever played in Atlantic Canada, with the Edmonton Eskimos meeting the Toronto Argonauts in Moncton on September 26 in CFL Touchdown Atlantic, the name chosen by Moncton area fans. • Canada Day Kickoff including a rematch of the 97th Grey Cup Game when the Saskatchewan Roughriders host the Montreal Alouettes on Canada Day, July 1st, followed by the Toronto Argonauts visiting the Calgary Stampeders later that evening, and the Winnipeg Blue Bombers hosting the Hamilton Tiger-Cats on Friday, July 2 and the BC Lions visiting the Edmonton Eskimos on Sunday, July 4. • CFL Retro goes seventies: This year the CFL and its teams are celebrating the 1970s with retro-themed jerseys by Reebok during Week 6 and 7. Details to follow. • Classic Labour Day Weekend match-ups featuring the Lions at Montreal, the Bombers in Regina, the Argos visiting Hamilton and the Eskimos travelling to Calgary. • Thanksgiving Weekend games that include the Eskimos visiting Hamilton, the Argos in Regina, Calgary in Montreal and British Columbia at Winnipeg. • A final weekend that takes on added significance after the battle for playoff spots went down to the very last game of 2009, this year has the Stamps visiting Winnipeg, the Lions in Hamilton, the Eskimos in Saskatchewan and the Argos travelling to Montreal. The CFL Playoffs feature the Eastern and Western Semi-Finals on Sunday November 14 and the Eastern and Western Finals on Sunday November 21. The are plenty of storylines already in place for 2010, including the Montreal Alouettes’ bid to repeat as Grey Cup champs, the Riders’ attempt to bounce back from a stunning last second defeat in last year’s Grey Cup in Calgary, the Stamps and Lions looking to return to the top in the West, the Argos and Bombers featuring retooled front offices and new head coaches, and the Hamilton Tiger-Cats, looking to continue their resurgence in the East. TSN returns as the CFL’s exclusive English broadcast partner of the regular season, playoffs and the 98th Grey Cup, while RDS will once again deliver fans French language broadcasts of all Alouettes’ games, the 2010 playoffs and Grey Cup. Of course, fans can download the entire CFL schedule, and follow our league all year round, at CFL.ca and their favourite team sites. Launched last July 1st, the new CFL Network – CFL.ca and seven of eight team sites – had more than eight million page views during the 2009 regular season and playoffs. And November, 2009 featured 1.1 million unique visitors to CFL.ca alone, a 75 per cent increase over November, 2008.